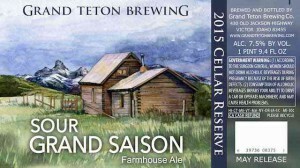 VICTOR, ID – Grand Teton Brewing Company, known throughout the West for their exceptional craft brews, is proud to announce the release of Sour Grand Saison, the second in their 2015 Cellar Reserve series. Grand Teton Brewing first brewed The Grand Saison in 2011. 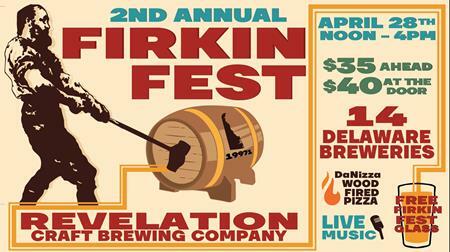 It was one of their customers’ favorite beers, garnered rave reviews and won a major international competition. 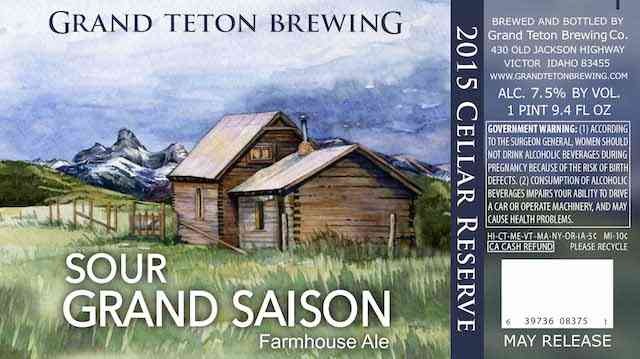 Not content to rest on their laurels, Grand Teton’s brewers have updated the beer for 2015. Using an old brewing technique called “three threads,” they blended a trio of unique beers into one harmonious whole. The brewers of Grand Teton started by reproducing The Grand Saison 2011 recipe. The first “thread” follows centuries of tradition, using European hop varieties—German Hallertauer Tradition, UK Goldings, Czech Saaz and French Strisselspalt. They used a very light base malt accented by just a touch of German Wheat and Munich malts. Finally, they fermented it very warm with a classic Belgian yeast strain to bring out the spicy flavors that are common to saisons. The second “thread” fermented with Brettanomyces Drei (also known as Brettanomyces Trois.) This wild yeast from Belgium produces a very delicate tartness with lovely aromas of tropical fruit like mango, peach, pineapple and guava. Finally, Grand Teton’s brewers produced a third “thread” of saison, this one soured with Lactobacillus, a common and beneficial microorganism that we encounter every day. It gives yogurt its tang and helps to ferment pickled vegetables such as sauerkraut. In Grand Teton’s Sour Grand Saison, Lactobacillus provides a delightfully tart, tangy and crisp, citrusy-sour flavor. Each of the three “threads” were carefully tasted and combined to create the wonderfully complex and delicious Sour Grand Saison. Saison is the original summer beer. First brewed in southern Belgium for thirsty farm hands, these crisp, bubbly, and refreshing brews demand to be consumed on hot summer days. Grand Teton’s version, with its acidity and blend of living microbes, should cellar well, becoming more interestingly tart and complex for several years. This style pairs well with an astonishing variety of foods. Drink it with grilled sausage or chicken, green curry with coconut milk, or a summer salad with vinaigrette and crumbled bleu cheese. Sour Grand Saison will be available May 15, 2015 in 1/2 and 1/6 bbl kegs and bottle-conditioned 750 mL cases.